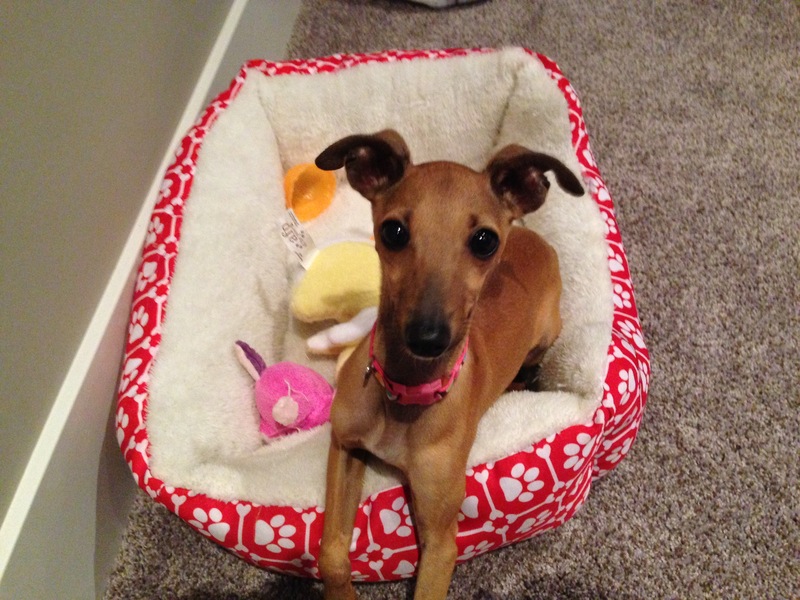 Ginger is a four-month-old mini Italian Greyhound who gets over excited, doesn’t always listen and needs some help with potty training. I’ve worked with Italian greyhounds before but never a mini. Ginger is amazingly cute but also astonishingly small. Her guardians told me she weighed in at around 5 pounds but you would never know it based on her energy level. She darted around the room like a little speedy Gonzales, rarely stopping for longer than a nano second. I started off by asking them how they had potty-trained the pup. Often dog guardian’s talk to their dog as if they speak English, telling them to “go potty” when they get outside. While this is logical for the human, the dog doesn’t have a reference point so “go potty” doesn’t mean anything to the dog. I went over how Ginger’s parents can “mark” the action of eliminating with the command word, then how to add in a high value treat to use the benefit of positive reinforcement to teach the dog that eliminating outside was something that is rewarded. After we finished the potty training clinic, I offered her guardians a few tips on how to disagree with her jumping up on them. 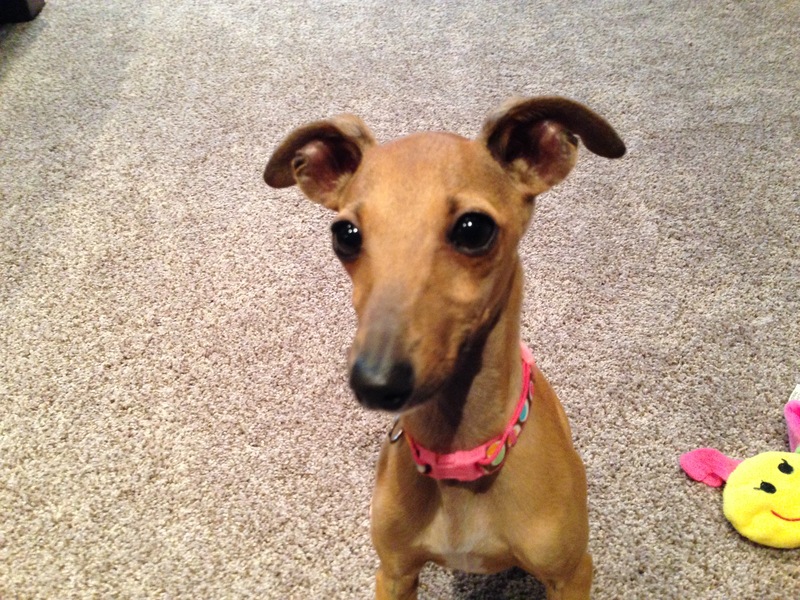 Because of her small stature and the tendency of Italian Greyhound bones to break, I wanted to adopt a less invasive method of correcting or disagreeing with this action. The audio cue I use is similar to the hissing sound (sssssss) a cat would use to warn a person or animal to back off. I explained that I use this sound any time I want to disagree with a unwanted action or behavior. I use this sound for two reasons; first the dog knows that humans are talking to it rather than to one another. The second reason is dogs are predisposed to recognize a hissing sound as a warning because so many animals use this sound. I hiss at a dog whenever I want to say “no,” “don’t do that” or “don’t even think about doing that.” I only hiss once and I match the intensity of my hiss with the energy level of the dog. If the hissing sound doesn’t stop the dog then I take it to my first escalating consequence; standing up abruptly and turning to face the dog. With a human stands upright and faces the dog, this is the most authoritative position you can assume. If standing up and facing the dog doesn’t get the reaction that I want, I move onto my next escalating consequence; marching directly at the dog until the dog turns away or sits down. Dogs give and take territory from one another as a form of communication. When a dog is not adhering to my reprimand, marching towards it in a brisk pace until it turns away or sits down is a great way to help the dog and understand that I mean business. The final consequence that I use is placing a dog on a leash than stepping on the leash about a foot away from the dog’s collar. I give the dog just enough room to stand or sit next to me, but not much else. Whenever I place a dog into this position, I keep my foot on the leash until the dog returns to a completely calm and balanced state of mind. To help put a stop to Ginger’s habit of jumping up on the members of the family, I advised them to start giving the dog a counter command of sit or lie down anytime she engaged in this action. By only petting the dog or providing affection and attention for doing a requested action, we can help condition the dog to engage and actions that we like. To provide an alternate option, I showed the family members how to condition Ginger to go to the dog bed at the far side of the room. I did this in three ways; tossing a high-value treat into the bed while the dog was watching, tossing a treat into the bed while the dog was not watching and leading the dog over to the bed by offering a treat so the dog would follow. No matter how we offered the treat, any time that it touched Ginger’s lips, I had the members of the family start repeating a command word of “bed.” Over the course of the session I probably tossed a couple dozen treats into this bed and the effect was pretty immediate. Prior to the session, Ginger used this dog bed at the end of the evening or when she wanted a place to leave her toys. But I wanted the dog to learn to go to this location anytime it was jumping up, being annoying or when the humans just wanted some space. By repeating the command word each time the dog gobbled up a treat while standing or sitting in the bed, Ginger started to develop an even deeper positive association with the bed. After a half dozen treats in the bed this way, Ginger started to come over to investigate the bed every few minutes, even when there was no treat inside. It will take another couple of days of tossing, leaving or leading Ginger to get treats in the bed before the dog goes over to this location on command, but once she does it will make it much easier for her family members to redirect unwanted actions or behaviors. To help deepen the bond between humans and Ginger, I had the family arrange themselves in a large circle in the living room. I passed out a small handful of high-value treats to each member of the family then went over some hand motions to incorporate whenever the dog failed to respond to the verbal recall command. At first it took a little extra emphasis and repeating of the command words to get Ginger’s attention. This is natural as she is still a very young puppy. However as we practiced, the human’s technique got better about the same time that Ginger’s response did. I suggested that her family practice this exercise once or more times a day over the next week or two. Because this is a simple exercises that uses positive reinforcement to reward wanted behaviors, it will really help the members of the family and the dog connect on a deeper level. Next we went outside to the families unfenced backyard. The family’s father told me that Ginger was very good at staying close to their home and not wondering off too far. I advised him to keep a careful eye on the dog especially because we are so close to the 4th of July. During the session one of their neighbors started lighting off some very big fireworks which Ginger handled very well. However it is possible for the dog to become startled and we want to make sure that she doesn’t engage her flight mode and get into trouble trying to run away. That said, the Fourth of July wasn’t my only concern. Just like human teenagers do, puppies go through rebellious stage once their confidence reaches a certain level. Having the dog in a fenced in enclosure or on a leash prevents the dog from running away when that time comes. I suggested that the members of the family practice the recall exercise outside in the backyard after they have mastered the exercise inside their home. Just like anything else, recall on command is a skill. The more practice the dog has with it, the better it’s response will be. This is an important quality in all dogs but especially important to anyone who does not have a fenced in yard. The family did have a workaround for their lack of fencing; a freestanding gated pen that they kept on their back porch. The father informed me that he placed the dog into this fenced in area each morning before getting the kids ready for school. Because of Ginger size and how quickly she moved, I came up with a training exercise that the family can use that includes this freestanding structure. I started out by tossing a high-value meet treats into the enclosure to judge the dog’s reaction to it. Ginger walked right in to get her reward without any hesitation which shows me that she has a positive association with the pen. After tossing in a few treats I tossed in another one and this time followed silently behind the dog so that I was standing at the gate to the enclosure. Once the dog was inside the pen I closed the door and waited for the dog to recognize that was the situation. Once Ginger realized the gate was closed, she started pacing around the enclosure as well as pawing at the gate in attempt to get free. Dogs often feel confined when a gate is closed in the kennel or pen area so I opened the door to alleviate this concern. As soon as ginger saw the gate was open she attempted to exit the pen. Because of her size, I only opened the gate about 12 inches wide and stood in position right outside the opening. As soon as Ginger started moving towards the opening, I took a sudden and deliberate step forward to communicate that I disagreed with her movement and attempt to leave the enclosure. I waited for Ginger to stop moving completely then immediately took a deliberate step backwards away from the gate. I stopped and observed the dog waiting for her to make the next move. A few seconds after I took my step backwards Ginger started to move towards the exit again. As soon as she did, I took another sudden step towards the gated area to communicate that I still disagreed with her attempt to leave. We kept at it for a few more moments until I was able to walk a few feet away from the enclosed area while Ginger remained inside on her own. The next step was to wait for Ginger to assume a more subordinate body posture; sitting or laying down. I wanted the dog to put itself into one of these two positions on its own as that is a dog’s way of signifying that she was no longer challenging or trying to get out of the kennel. It took a few minutes, but eventually Ginger sat down. As soon as she moved into a sitting position I crouched down and extended my arm towards her holding a high-value meat treat in the palm of my hand. I gave her a recall command which got her to stand up, but she paused when she got to the open gate. This pause was a result of the dog remembering that I had asked her to stay inside the pen. I gave Ginger another recall command and this time she slowly and cautiously stepped outside of the pen. I held the treat out in front of her to make sure that she was properly rewarded for following my command. After completing the exercise, I coached one of the families young daughters through it a second time. It took her a little bit longer than it did for me to get Ginger to stop trying to exit the pen. However Ginger did not pace as much inside the enclosure and was noticeably calmer during the exercise. After about five minutes, Ginger sat down inside the pen once again. As soon as she did, I had the family’s daughter crouch down into a kneeling position and gave the dog a recall command. 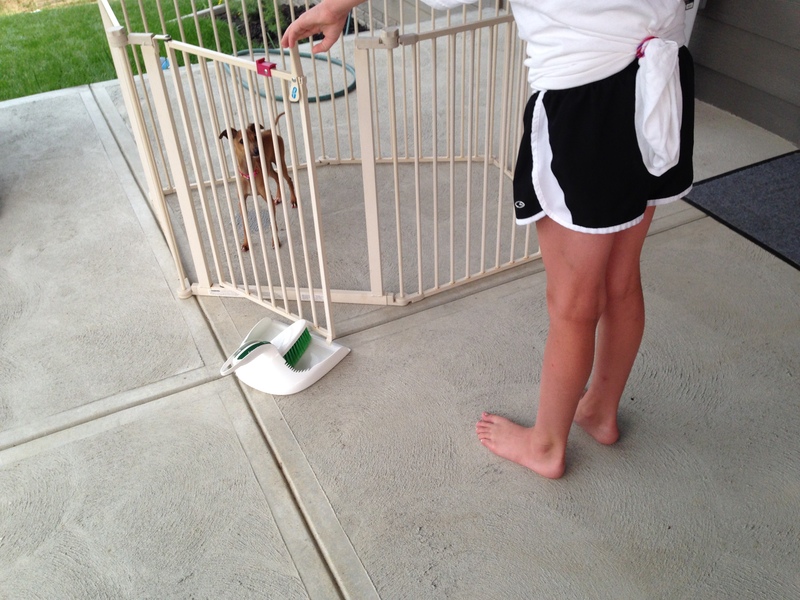 This time while Ginger was cautious leaving the pen she did not stop when she got to the gate opening. This shows the dog was starting to understand the rules of the exercise and feeling more confident about it. By the time we wrapped up the season, the dog was jumping up on her guardian’s far less frequently, was responding to the recall command better and was going over to her bed on her own. Her family members will need to continue to practice the exercises, consequences and new techniques over the next few weeks for the new behaviors and desired actions become something Ginger adopts. But based on her intelligence and how quickly she picked things up in our session, it shouldn’t take long.